Registration for the 2019 CrossFit Open Is Live! We’re already Four weeks into 2019, which means we’re 4 weeks out from the 2019 CrossFit Open. Last week, CrossFit HQ announced that registration for the 2019 CrossFit Open is now officially live, and if you’re interested in signing up, then check out this link. The 2019 Reebok CrossFit Games Open is the largest fitness competition on Earth and an exciting showcase of the CrossFit community. Here, athletes like you, from all around the world, show up and push themselves further than they ever thought possible over a five-week period. Challenges, PRs and the unknown await! People of all ages and ability levels can play, Rx’d or Scaled. Calibrated CrossFit is keeping the tradition alive to host the Reebok CrossFit OPEN! Last year we had a little under 70 members register! Can we hit 100 this year!??? Feb. 21 kicks off five weeks of OPEN workouts. Talk with any of the coach’s to help get a game plan! This year’s Open will span five weeks similar to previous CrossFit seasons, and begins on February 21st. The full five-week workout schedule can be seen below. – Every week, workouts are released on Thursday evenings at 8 P.M. EST, and athletes then have the ability to submit workout scores until the following Monday at 8 P.M. EST. – Workout announcements typically come in the form of ceremonious events where Castro announces the workout live, then top athletes take each other on head-to-head in a live broadcast streamed across the globe. Why Register For The OPEN At Calibrated? – At Calibrated, we dedicate every Saturday morning to the Open workouts for all registered members. We assign heats, we print score sheets, we assign judges – we make it a big deal. But we also keep it fun. We chant unintelligible words and if we’re lucky we get to see Brittany Smith dance goofy. It immediately bonds us because it feels like we’re going to battle together in a light hearted way. We’re all nervous, but when we put our hands in the circle and yell at the top of our lungs, it is our buy-in to the team. It roots us deeper into our community. Yes, You Are Good Enough. – Even if you cannot do the exact prescribed weight of any or most of the Open workouts, you will most likely surprise yourself with what you are able to pull off. The Open is about calling on the best in yourself no matter your current level. Most likely you are physically stronger than your mind lets you believe. – Many of us competed as kids whether on an organized team or just racing siblings to the car. Some of you may have competed in college. When we become adults, we often feel like we need to retire that side of us. Sure, we compete for jobs and accounts and other “grown up” things, but more often than not, we have forgotten the thrill of physical competition. We may not be a win-at-all cost type – and this certainly is not the only kind of competitor – but there is something about putting yourself on the line that sparks inspiration. February 15thwill be the last day to register for the OPEN if you plan on completing the OPEN at Calibrated. First workout announcement is Thursday (Feb 21st). I need this 1-week grace period to properly plan and organize the logistics of this years open. We will be creating teams of 15-20 people this year. Each team will have a captain and Each week the team will be rewarded points for various things like….completing the workout, participating in the teams weekly theme, top scores in rx, scaled, and age divisions, etc. Most points are generated just from participation but there will be performance-based points awarded. The Heat & Judging Schedules will be posted every Thursday Evening by 11pm on our Calibrated “Members Only” Facebook page and our Website (WOD/BLOG). Heat Times will be from 8:00am – 12:30pm every Saturday. This may slightly vary each week based off the workout released! There will be NO regular Saturday classes during the 5 weeks of the OPEN. Any registered athlete not able to attend the upcoming Saturday must email arjuna@calibratedtraining.com by Wednesday evening of each week to reschedule. If you do not email me by this time, you cannot reschedule. 1-2 heats is all that is asked of you for the weeks that you can help out. Signing up to be a judge does NOT mean you have to judge every week. Just the week that is convenient for you! All that we ask of the judges is to be ready when your heat is called and to uphold the integrity of the standards of each workout. PLEASE EMAIL ME AT ARJUNA@CALIBRATEDTRAINING.COM IF YOU ARE A JUDGE OR WOULD LIKE TO BE A JUDGE! Being a judge just means you count someone reps and mark down there scores correctly. The last OPEN workout will be held as a charity event for Children’s Hospital Cancer Center. More details regarding this will come later. Time for the best party of the year! Potluck style food & drink. Bring family, friends, kids! Let’s unwind and celebrate making it through the Open! You must arrive early and warm-up on your own. At exactly 15 minutes before each heat everyone will draw a number from a hat. That number will determine the order in which you will pick a pull-up bar. If you pick number 18 then you pick last. If you pick number 5 then you pick 5th, etc… Please remember, this is a Hero workout and we are doing it to honor a fallen Hero. Making a fuss about not having your favorite bar just wouldn’t make sense. I look forward to seeing everyone here on Monday! Good Luck! 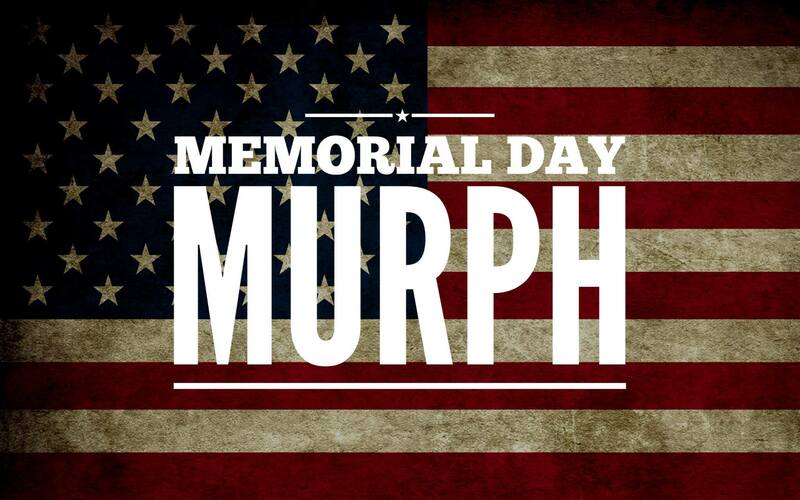 Memorial Day Murph sign up at front desk! 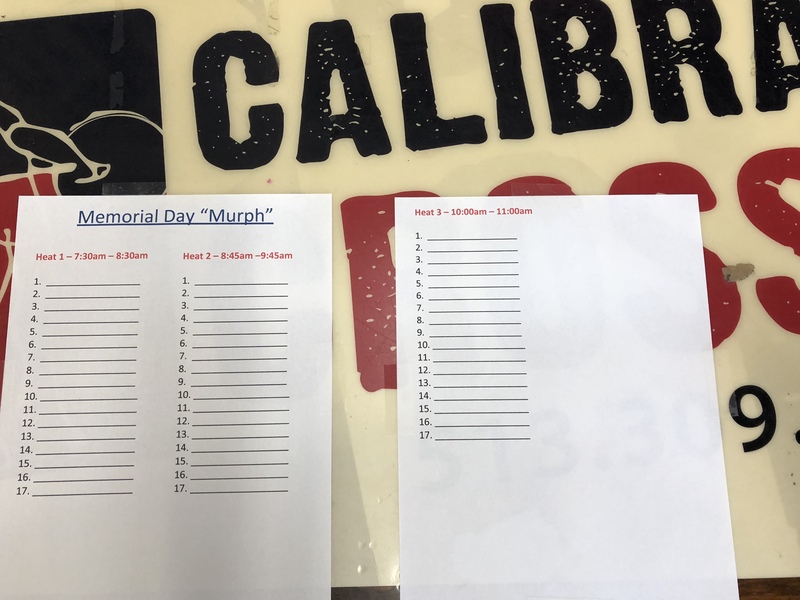 You must sign up in order todo Murph here at Calibrated. There will be no regular class times on Memorial Day. Please do not sign up if you are unsure whether you can make it. Heatswill be full so it would be unfair to take a spot then no show or cancel the day before. We will have an RX and Scaled workout. Both will be capped at 60 minutes. All Workouts will be posted to sugar WOD. Please download APP to view. Once the App is downloaded Email arjuna@calibratedtraining.com for access code.